Sarah Platt Art is now offering two types of commissions. Sarah has a small team of skilled, ‘Sarah Platt Art’ trained apprentice artists. Sarah may do the whole painting herself, or she may involve an apprentice artists to help create your piece. Even if Sarah uses an apprentice artist to help on the piece, Sarah will still personally consult with you, design the work, oversee each step of the painting, and paint back into the work to complete it to the Sarah Platt standard. 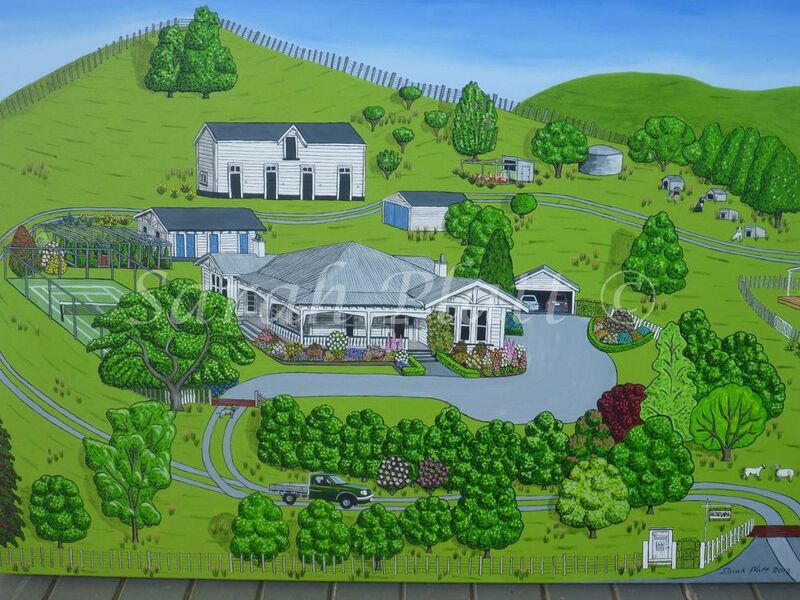 This is where your home, or a composition of your home, business and other buildings of significance to your story are designed and painted in the iconic Sarah Platt style. A commission of this kind involves consultation with Sarah. The price will be between $3,000 and $7,000 depending on the amount of detail and research required. This is an exciting new package deal Sarah Platt Art can now offer. It provides the client with two pieces of work. The first is a small beautiful but simple original of a building of your choice, be it your home or business. The building you require painted will need to have a good enough frontage to work in this style. 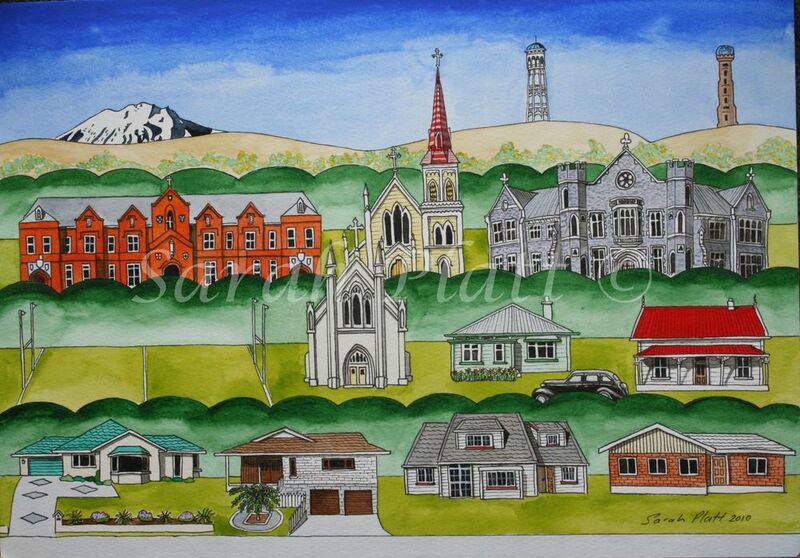 The second piece of work is a print, either framed or as a stretched canvas from the Love Manawatu collection. 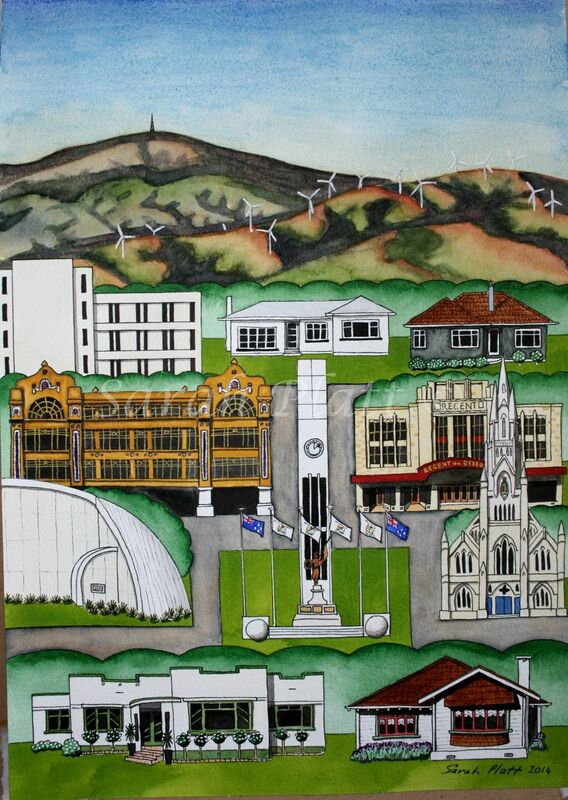 So for example if you wanted the 'Love Palmy' image, it would be printed, but it would have one of the buildings digitally removed and replaced with a digital image of the original painting of your home or business. 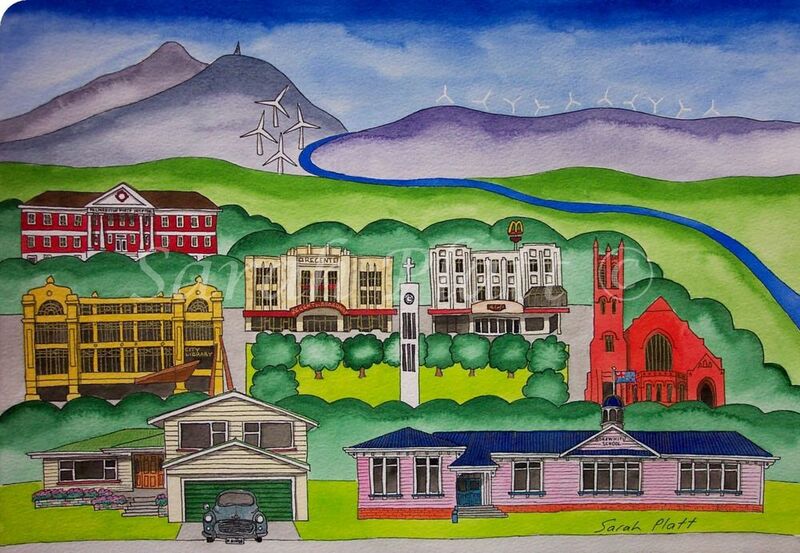 This way you get both the original wee painting (A4 size) of your home or business, and a personalised large print of your town that includes your home in the composition. 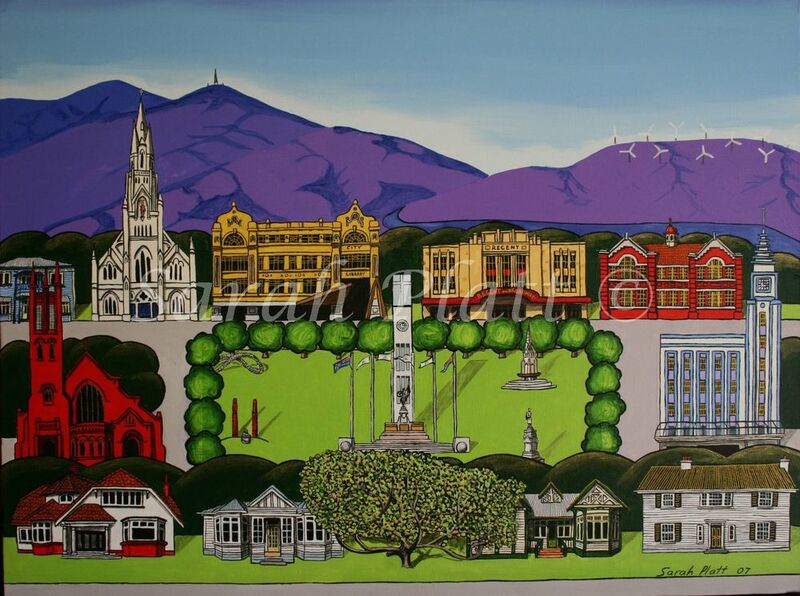 If the client wants more than one original building painted, they will need to add an additional $500 for any extra buildings up to 4 buildings in this deal depending on the building and which image for the Manawatu collection they choose. More than that will require a new original commission to be designed and painted. Sarah Platt art is also able to offer the prints on large toughened glass wall for $1,700 per square metre. This is a stunning way to present the work and can be printed and installed at impressive sizes. Pictures of some of Sarah Platt's Commissions.